Give Your Kitchen A New Lease Of Life! We all know how popular the kitchen is in any home, it is the central hub of socialisation. Used for various things, ranging from your typical food preparation to the centre of a social gathering. Being such an important room, will mean a lot of traffic and your kitchen may begin to lose its once sharp edge and become a dull shell of its former glory. Here at Solutions we have some tips for you to bring back that edge without delving too deep in to the piggy bank! Giveit a splash of colour? 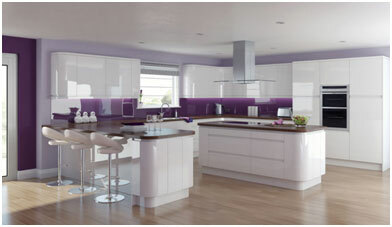 Giving your kitchen a new flash of colour can be an instant way of refreshing a room. Whether it’s in the form of a modern new Glass Splash Back or a Bright Blue Bar Stool, you don’t have to break the bank. Give your units a fresh face, doesn’t matter if you go for gloss, matt, if you go for a vivid colour or a more natural one. Applying just a little bit colour will go a long way. Giveyour cupboards a face lift? Don’t keep all your prize possessions hidden away, like your silver ware or extensive collection of cook books, put them out on display for the world to see. Invest in some floating/open glass shelves; available with LED lighting. Get rid of those out of date cupboards, also great for house plants and ornaments too as well as providing easier access. Change your original cupboard handles for something a bit more up to date. Give your cupboards superior eye catching abilities with this simple change and at the same time create more talking points for the room, during those social gatherings. Here at Solutions we have companies that special in practical and decretive handles so if you can think it we probably supply it! Give your work surface a re-finish? Re-fitting a work surface is a quick and easy job and can make a huge change to your kitchen. At Solutions we have a full sample display for our work surfaces ranging from our bespoke granites to your more cost efficient laminates. With a fitting service supplied with our granite and Quartz surfaces and with our personal fitting service available for our laminates replacing your work surface is as easy as picking your finish, ordering and booking your fitting. In other words 1, 2 and 3. Making changes or adding new additions to your kitchen can be quite exiting but at the same time pretty daunting. Here at Solutions we have a professional team of designers who are happy to offer you friendly and experienced guidance, so give us a call on 01623 515793.